For almost a hundred years, viewers have speculated over a shadowy figure that appears to be slowly emerging from behind a famous Degas portrait. Now, researchers have used a new imaging technique to look behind the painting—and they’ve discovered a secret portrait. The artwork in question is Edgar Degas’ Portrait of a Woman, painted around 1876. At first, it appeared to be—as the name suggests—a fairly ordinary portrait of a 19th century woman. But around 1922, viewers began to suspect there was something unusual about the portrait. As the painting aged, an outline of a second figure started to become clearer and clearer. The conservators of the painting at the National Gallery of Victoria were curious but didn’t want to damage the existing portrait. And so, using a new X-ray technique, researchers discovered that underneath the portrait is a never before seen portrait of a woman that they believe to be frequent Degas model, Emma Dobigny. Traditional X-ray techniques wouldn’t have been sufficient to reveal the image. Instead, a newly-developed X-ray detector that uses fluorescence, called the Maia detector, is responsible for the depth of the scan. The process is detailed in a new paper in Scientific Reports. The new X-ray images were detailed enough that they didn’t just reveal the portrait underneath; they also revealed what the portrait had looked like at multiple stages. 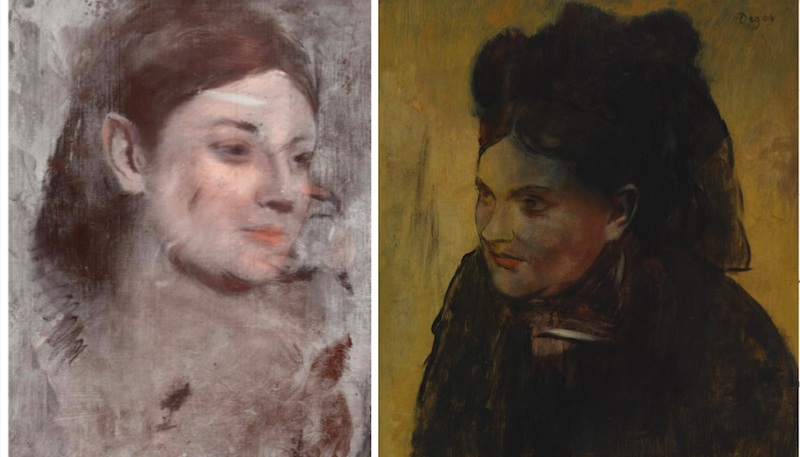 For instance, the researchers were able to see that at one point, Degas had painted a pair of large, pointed, elf ears on the woman in the hidden portrait, before eventually painting over them for a set more like Dobigny’s own. Although we now know what lies beneath the portrait, we still don’t know why it’s there. Sometimes hidden painting are simply due to an artist’s commitment to not wasting their materials. But sometimes what an artist hides underneath a painting has meaning for the painting above it as well. For instance, this 17th-century seascape includes a secret portrait of a beached whale. However, the reason behind Degas’ hidden portrait remains a secret, and art historians can’t exactly ask Degas why it’s there.